Lawren Harris (1885-1970) was a renown Canadian artist and pioneering modernist who profoundly influenced the history of painting in Canada. 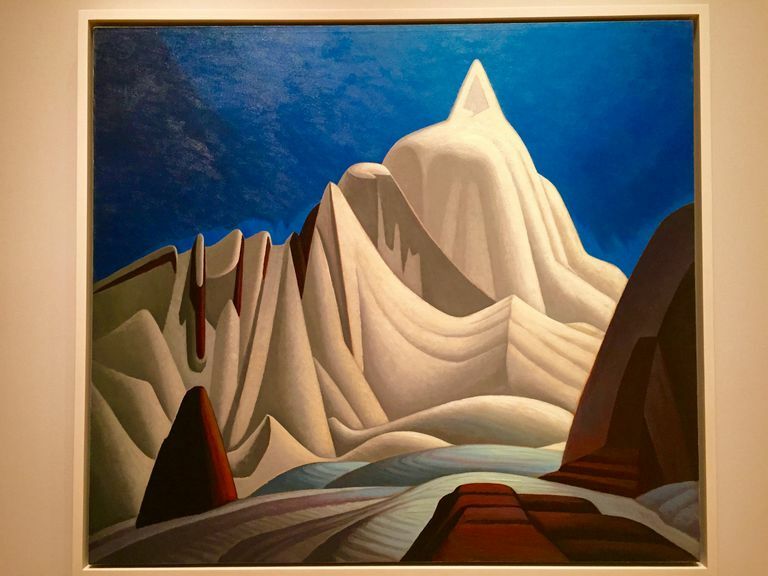 His work has been recently introduced to the American public by guest curator Steve Martin, the well-known actor, writer, comedian, and musician, along with the Hammer Museum in Los Angeles, and the Ontario Museum, in an exhibit titled The Idea of North: The Paintings of Lawren Harris. The exhibit first showed at the Hammer Museum in Los Angeles and is currently being shown through June 12, 2016 at the Museum of Fine Arts in Boston, MA. It includes approximately thirty paintings of northern landscapes Harris did during the 1920s and 1930s while a member of the Group of Seven, encompassing one of the most important periods of his career. The Group of Seven were self-proclaimed modern artists who became the most important Canadian artists of the early twentieth century. (2) They were landscape painters who traveled together to paint the magnificent landscape of northern Canada. Harris was born the first of two sons into a wealthy family (of the Massey-Harris farm machinery company) in Brantford, Ontario and was lucky enough to receive a good education, travel, and to be able to devote himself to art without having to worry about earning a living. He studied art in Berlin from 1904-1908, returned to Canada at age nineteen and supported his fellow artists as well as creating studio space for himself and others. He was talented, passionate, and generous in supporting and promoting other artists. He founded the Group of Seven in 1920, which dissolved in 1933 and became the Canadian Group of Painters. His landscape painting took him all over northern Canada. He painted in Algoma and Lake Superior from 1917-1922, in the Rockies from 1924 on, and in the Arctic in 1930. When I saw the exhibit at the Museum of Fine Arts in Boston I was struck by how similar Harris's work is to another great iconic landscape artist of the same period, American Georgia O'Keeffe (1887-1986). In fact, some of the work of Harris's contemporaries from America are displayed with some of Harris's paintings as part of this exhibit to show the connection between them, including among them the works of` Georgia O'Keeffe, Arthur Dove, Marsden Hartley, and Rockwell Kent. Harris's work from the 1920's on is similar to O'Keeffe's in both scale and style. Both O'Keeffe and Harris simplified and stylized the shapes of the forms they saw in nature. For Harris it was the mountains and landscape of the Canadian north, for O'Keeffe it was the mountains and landscape of New Mexico; both paint the mountains frontally, parallel to the picture plane; both paint landscapes devoid of human presence, creating a plain and austere effect; both paint flat colors with hard edges; both paint their forms such as trees, rocks, and mountains in a very sculptural way with strong modeling; both use scale to suggest monumentality. Harris started out representationally, painting the landscape as well as urban scenes from Toronto of houses and industrial subjects. As his work developed it became more symbolic, abstract, and minimal, especially during the years of painting with the Group of Seven and afterward. The paintings from the 1920s and later are done in a style that uses smooth, flat paint and few details.The landscape subjects from that time are mountains, clouds, lakes, islands, and trees, often dead trees or stumps. The colors in the paintings are predominantly blue, white, and brown, but also some subtle yellow, green, purple, and black. His later landscapes look unrealistic in their uniformity and geometry, but their scale conveys their massiveness and monumentality, and the carefully directed light captures their sublimity. Harris stopped signing and dating his paintings in the 1920s so that viewers would judge the paintings for themselves, without being influenced by attribution or date. There is a stillness that pervades Harris's paintings that, along with the soaring peaked mountains, is reminiscent of the stillness and soaring verticality of a Gothic cathedral, the intent of which is to bring one closer to God. Harris's paintings prove yet again that it is always better to see the actual original painting in person. The small reproductions of his paintings do not have nearly the impact that they do when viewed in person, standing in front of a 4'x5' painting of bold color, dramatic light, and monumental scale, or in a whole room of equally compelling paintings. I recommend you see the exhibit if you can.